Perhaps this sounds familiar to you: You're hungry in an unfamiliar city. You want to eat the best of whatever regional specialty the area is known for. The best pizza, the best dumpling, the best barbeque or whatever. So, you turn to the internet. One search turns into two… turns into ten… and pretty soon you're down a cross-referencing rabbit hole so deep into Google and Yelp reviews that all your options are closed anyway and you might as well give up and get a late-night cheeseburger. Been there? I have. I do this not only when exploring the culinary offerings of a new city, but when I prepare to cook something new too. For example, this happened when I bought pasta roller attachments for my Kitchen Aid and decided to try making pasta for the first time. As a Virgo I want to be perfectly skilled at a task the first time I attempt it lest I give up entirely. This is an especially problematic character trait when approaching pasta because there are so many ways to prepare something that is seemingly very simple. It's just flour, water and (sometimes) egg, after all. But what about the proportions of each ingredient? How long do you knead the dough? How thin do you roll the pasta? Use the whole egg or just the yolks? One books says this another website says that. Who do you trust? 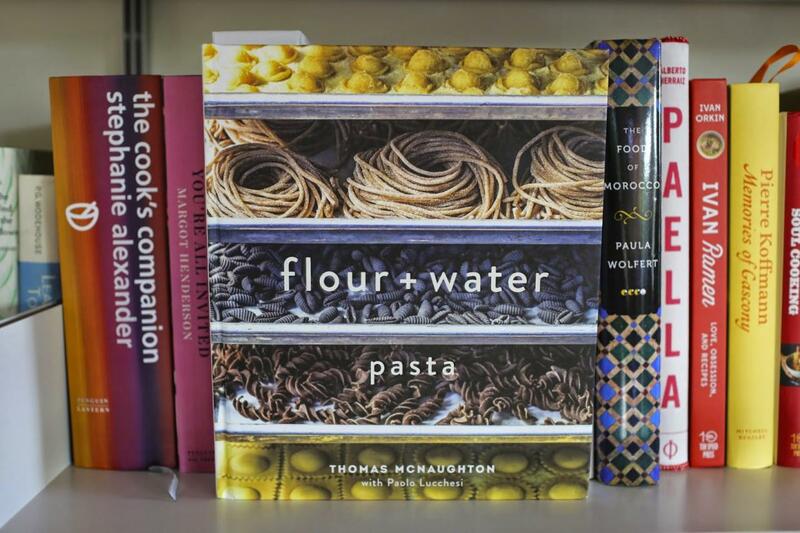 Well, after some agonizing I settled on the book flour + water: pasta by Thomas McNaughton. I've never been to the author's eponymous San Francisco restaurant which lead to the publication of this book, but that wasn't what mattered to me anyway. What appealed to me were the very precise recipes for different kinds of pasta dough. There is one recipe for standard egg dough, one for more pliable ravioli dough and others for semolina dough that is either hand-rolled or extruded. In each case you get the proportions down to the gram and detailed instructions for kneading and rolling it out. 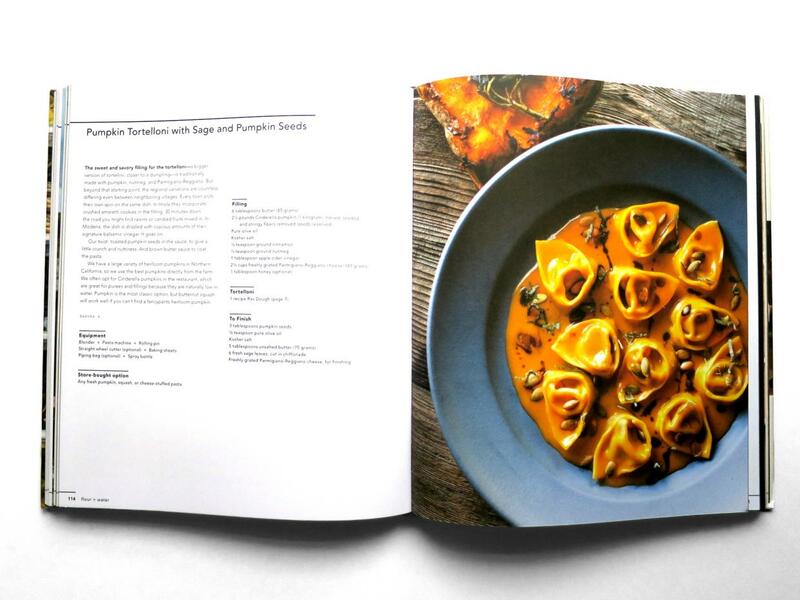 I'm also kind of a sucker for good graphic design in cookbooks and that was another factor that initially drew me to the book. However, I found out that this comes at the expense of instructions for shaping pasta that could be easier to follow. 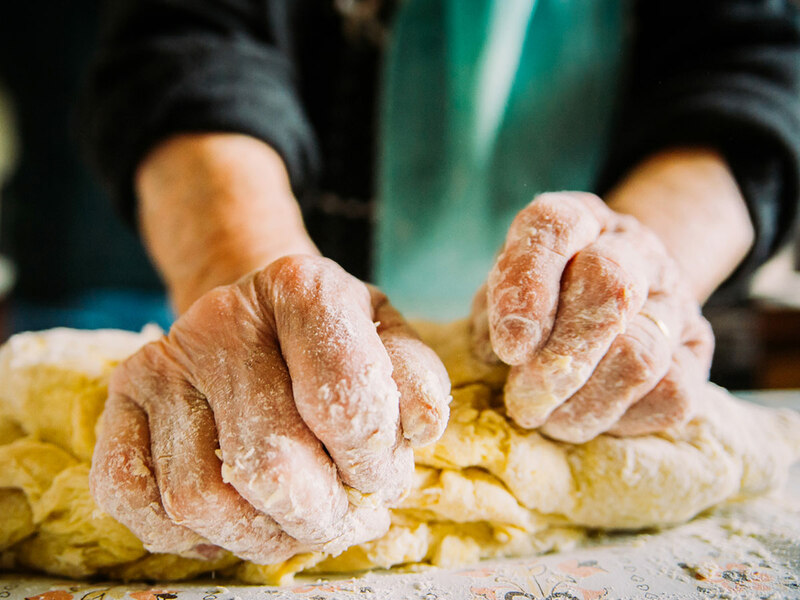 The photos could stand to be more instructive than decorative, but overall McNaughton provides great dough recipes based on his experience learning to make pasta in Italy, and the written instructions are pretty thorough if you read through them a couple times. The technique of starting with very dry dough and misting with a spray bottle while forming the dough so as to add only the least amount of moisture possible is really ingenious and is something I still do even when experimenting with other recipes. Once I felt comfortable with the dough recipes in flour + water: pasta I did eventually try other recipes for comparison. I have found that it's pretty hard to totally mess up pasta dough. There's a lot of room for variation in the final product, using whole eggs versus egg yolks for example, but you're not likely to end up with something truly inedible. (This article is a good exploration of how each element affects the final product.) In fact, since I was recently turned on to the magnificent treasure of the world wide web that is Pasta Grannies. I have relaxed a bit and started experimenting with less precise approaches to making pasta dough. 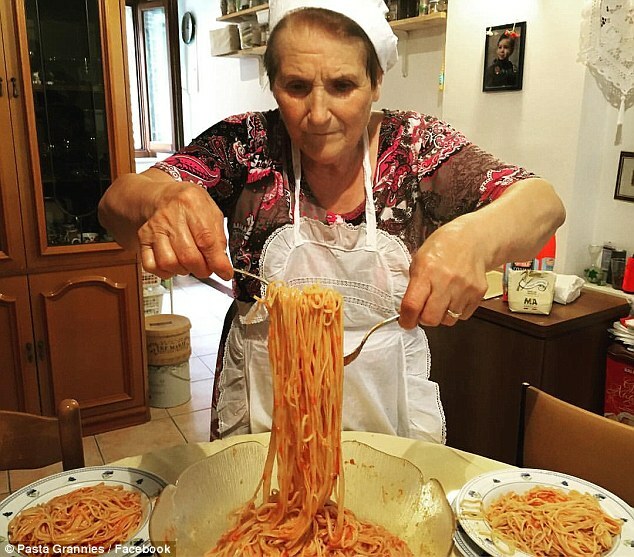 Where Thomas McNaughton seems to take pasta (and himself, actually) rather seriously and makes a refined scientific formula out of it, the YouTube series Pasta Grannies highlights the invaluable wisdom of the Italian women he learned the craft from in the first place. They don't use machines, they hardly measure or weigh anything, they don't appear to take themselves too seriously and I'm absolutely certain that anything the grannies prepare is better than any restaurant by an order of magnitude or two. I've only just begun to work my way through the years’ worth of videos currently uploaded, but it's both fascinating and inspiring to watch. Check out the one where they make a literal truckload of passata and be amazed. Plus, Pasta Grannies acts as a nice compliment to flour + water: pasta in that it highlights the simple and approachable whereas the book's recipes -- not for dough, but for the finished dishes -- assume you have access to squid ink, sea urchin or rabbit. Great if you're trying to impress somebody and have access to those ingredients, but not exactly accessible. So, what I've learned here is that homemade pasta is really rather forgiving and can be as complicated or simple as you want to make it. It's helpful, but not necessary to do a ton of research before getting started. 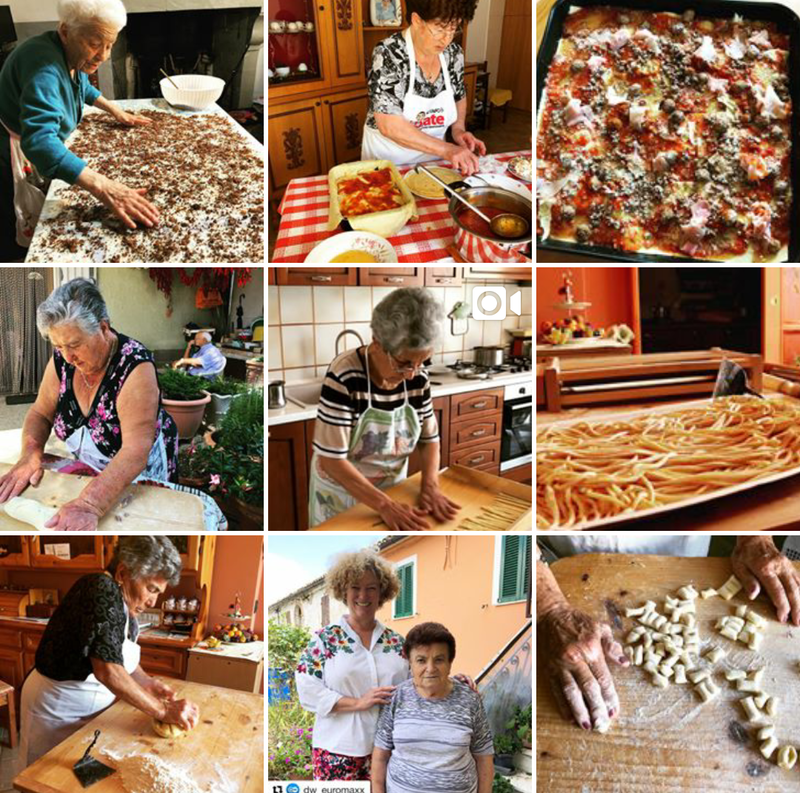 I say, watch a few Pasta Grannies clips and see if you're not inspired to make your own orecchiette or bolognese. For my part, I've got a lot of fresh eggs on my hands lately so my next project is impressive-looking, but hopefully not-too-difficult, uovo in raviolo.